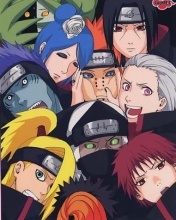 This Forum lets you be an Akatsuki member to RP with, you can be any of the 10 characters in the Akatsuki, there are rules that need to be followed which are in the Rules thread. 1. Chooce your character to roleplay. 2. Do not kill other members. 3. Stay in characters at all times. 4. If you wish to be OOC in this forum, create a topic with the title OOC in it. Everything the Members do inside the base. Here are all the rooms for each member.